In this exciting adventure mixed with amazing scientific study, a young, exuberant explorer and geoscientist journeys deep into the Amazon—where rivers boil and legends come to life. When Andrés Ruzo was just a small boy in Peru, his grandfather told him the story of a mysterious legend: There is a river, deep in the Amazon, which boils as if a fire burns below it. Twelve years later, Ruzo—now a geoscientist—hears his aunt mention that she herself had visited this strange river. 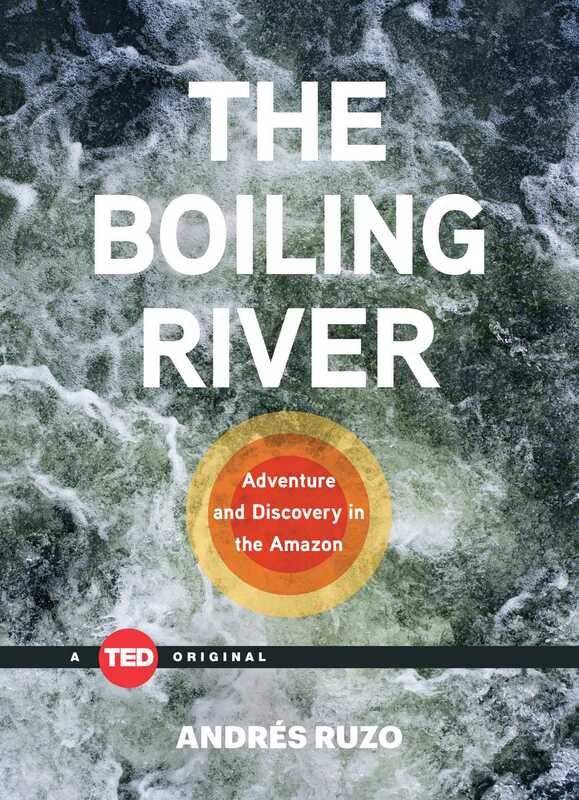 Determined to discover if the boiling river is real, Ruzo sets out on a journey deep into the Amazon. What he finds astounds him: In this long, wide, and winding river, the waters run so hot that locals brew tea in them; small animals that fall in are instantly cooked. As he studies the river, Ruzo faces challenges more complex than he had ever imaged. The Boiling River follows this young explorer as he navigates a tangle of competing interests—local shamans, illegal cattle farmers and loggers, and oil companies. This true account reads like a modern-day adventure, complete with extraordinary characters, captivating plot twists, and jaw-dropping details—including stunning photographs and a never-before-published account about this incredible natural wonder. Ultimately, though, The Boiling River is about a man trying to understand the moral obligation that comes with scientific discovery —to protect a sacred site from misuse, neglect, and even from his own discovery. I am standing on a rock in the middle of a river. Nighttime in the jungle pours around me. Instinctively, I reach up and turn off my headlamp. The blackness is complete now and I pause, waiting. I had missed the darkness. I breathe in. The air is thick and abnormally hot, even for the Amazon. As my eyes adjust to the dark, the outline of the jungle slowly distinguishes itself from the night: blacks, grays, dark blues, even silvery whites. It’s amazing what we miss when the lights are on. The moon is hardly a sliver, and innumerable stars dominate the sky above, illuminating the vast jungle and bathing each leaf and rock with their soft light. All around me, vapors rise like ghosts in the starlight. Some are thin streams of mist; others are clouds so large that their billowing appears to be in slow motion. I lie down on the rock and am still, watching the steam rise into the night. When a cool breeze blows, the mists thicken and roll, forming pale gray-blue eddies against the sky. The rock beneath my body glows dimly white in the faint light. Where my back and legs touch the rock’s surface, I’m sweating lightly. A torrent of water, hot enough to kill me, wider than a two-lane road, surges past my rock, emitting a roar that drowns out the jungle’s nighttime chorus. My senses are sharp and every movement is keenly deliberate. I stand, make sure I have a firm footing, and jump back onto the nearest shore. As I look back at the Boiling River I can’t suppress an excited whisper: “This place exists. This place actually exists.” I remember the shaman saying the river has called me here for a purpose, and I can feel a greater mission about to take place. I won’t get much sleep tonight. The vapors dance in the starlight as I make my way back to my hut, my mind filled with thoughts of the river, the dark jungle surrounding it, and the story that remains to be written. It’s a story that began with a legend heard in childhood—a story of exploration and discovery, driven by a need to understand what initially appeared unbelievable. It’s a story where modern science and traditional worldviews collide—not violently but respectfully—united in their sense of awe for the natural world. At a time when everything seems mapped, measured, and understood, this river challenges what we think we know. It has forced me to question the line between known and unknown, ancient and modern, scientific and spiritual. It is a reminder that there are still great wonders to be discovered. We find them not just in the black void of the unknown but in the white noise of everyday life—in the things we barely notice, the things we almost forget, even in a detail of a story.